It’s amazing how many different lists of best honeymoon destination you can find online if you do a search. Figured I was on a roll, so I tried a Yahoo search and got a list of Ads related to best honeymoon destinations (from Kayak, Trip Advisor, Emirates Vacations and Rancho Valencia- whoever that may be). I hope that you are getting the point that an internet search of great honeymoon destinations can be time consuming and frustrating. Just in case you haven’t seen enough great honeymoon destinations, Click here to see what U.S. News Travel thinks the best honeymoon destinations are for you- without knowing anything about you. 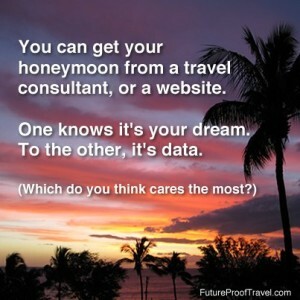 After you’re done checking out the millions of sites telling you that they know which honeymoon destination is the best for you, contact My Vacation Lady. As the top rated honeymoon specialist located in New Jersey according to the brides on Wedding Wire and the Knot, we’ll take the time to get to know you, your likes and dislikes, your dreams and budget. We can customize a honeymoon package just for you— around what kind of experiences you have dreamed about. No need to search needlessly online through millions of websites telling you where to go. My Vacation Lady will be able to help plan your honeymoon experience based on getting to know you. We won’t be the first to tell you that your honeymoon should be special but we are the right honeymoon specialists to make it special.